Have you ever read a book that from the very first page, you knew you wouldn’t be able to put it down? Well that’s how The Secrets We Keep by Stephanie Butland is and I was hooked right from the very first sentence. I was so enthralled by this book that my husband was having a hard time pulling me away from it. He even tried to tempt me dinner (how cute!). Stephanie Butland wrote this book to include letters Elizabeth was writing to her husband after his death. This was one of my favorite aspects of the book because it dove into the deeper feelings of Elizabeth. These are the feelings that many people won’t discuss with anyone else and the ones they keep to themselves. So being able to feel exactly what Elizabeth was feeling helped bring the book to another level. That one small paragraph instantly made me think about my husband. It made me think, would I feel the same way? Would I grieve the same way? Would I want to keep his toothbrush and shower gel just to feel as though he’s still with me? I don’t know for sure, but when anyone loses the person they love it’s one of the hardest things to come to terms with and strange things,, like keeping their toothbrush don’t seem so strange. As I read the book, I was able to predict what each “secret” was, but that didn’t keep me from enjoying the book. It actually made me want to read it more quickly so that I could find out how it was revealed to the characters. There were several times when I felt really sorry for Elizabeth because as each secret came to light she seemed to go back to the beginning of the grieving process and couldn’t come to terms with anything. Everything was becoming too hard for her to handle and she was cutting herself off from the world, which is not what you should do in her situation. In the end, Elizabeth did come out of the darkness and started walking a path towards forgiveness. 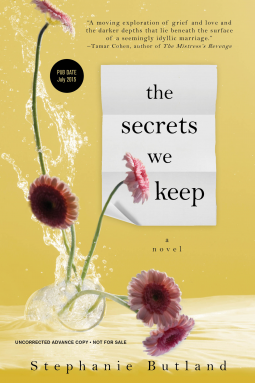 The Secrets We Keep is a powerfully heart wrenching novel that takes you through the different stages of grief, time and time again, as each secret is revealed. I would highly recommend this book to my followers who enjoy reading Women’s Fiction novels.